Dese’Rae Stage describes Live Through This as a collection of portraits and stories of suicide attempt survivors, as told by those survivors. Actually, this 2015 quote from the Human Rights Campaign referred to National Coming Out Day and the LGBT civil rights movement. But, it could have just as easily been applied to the pioneering efforts of Dese’Rae Stage, Cara Anna, Heidi Bryan and the many others, who like Harvey Milk, have spoken out and encouraged others to do the same. 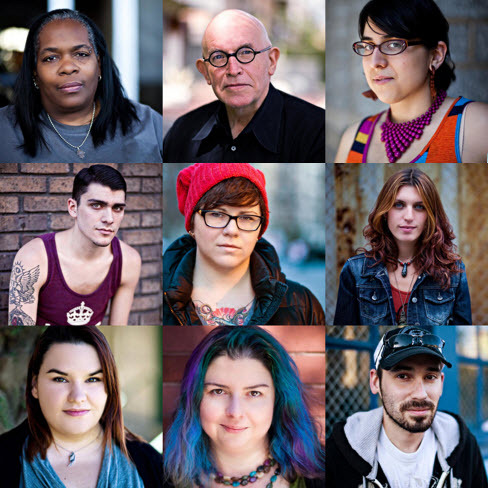 On Thursday night, December 10, RI International hosted a different kind of Coming Out Day with a twilight courtyard exhibit featuring Dese’Rae’s award-winning collection of portraits. In addition, the event featured Philadelphia’s Behavioral Health Commissioner Dr. Arthur C. Evans, whose recovery oriented approach is transforming the City’s service system. Dr. Evans began with a brief YouTube video on the City of Philadelphia Porch Light Mural Arts Program, and asked, “what does healing look like?” The answer. A space and place to share… that is created together, as a community. The Philly experiment is big and bold. The Virtual Tour website showcases 20 murals that have been created around the city in partnership with behavioral health clinics and people receiving services. 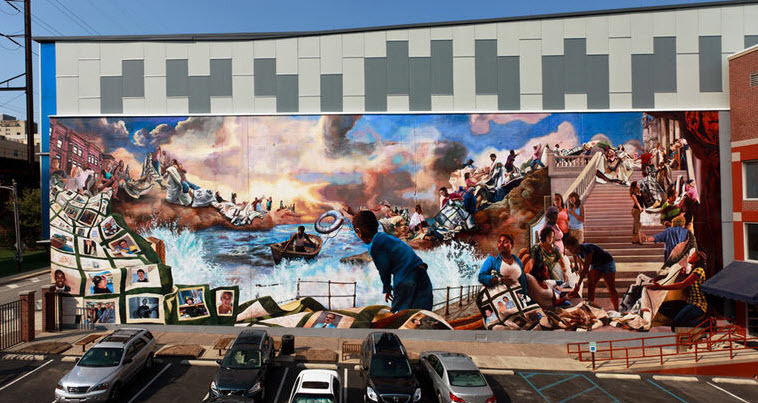 In just one of those examples, over 1,000 community members put paint to the wall with the three story, 100+ foot long “Finding the Light Within” mural at 120 South 30th Street. Working closely with the American Foundation for Suicide Prevention, the Crisis Response Team of Philadelphia and many other local advocacy groups, muralist James Burns set out to shed light on suicide by providing an opportunity for relationship building among those bereaved by suicide, those with a history of attempts and their families and friends. The result is visually stunning and filled with rich and amazing detail. Dr. Evans’ presentation inspired us that art can light the way to hope, resilience and a connection to each other. Next, Dese’Rae shared her own painful story of depression, loss and suicidal thoughts. “But, I’m not a special little snowflake,” she followed, and pointed us to the amazing collection of photographs that encircled us. These included friends and leaders like Leah Harris and Dr. Bart Andrews, the latter of which came out of the closet about suicide just last year. This quote in fact came from Dese’Rae’s Live Through This website. But, it could have just as easily been used on National Coming Out Day. It’s time to tackle the last stigma. The Live Through This project has been covered by the New York Times, Associated Press, Upworthy, NPR, the Glenn Beck Program as well several other radio and TV programs. In 2015, Dese’Rae won the inaugural Paul G. Quinnett Lived Experience Writing Contest and was named New Yorker of the Week by NY1 News. In 2015, Dr. Arthur C. Evans was recognized by the White House as an “Advocate for Action” by the Office of National Drug Control Policy. In 2013, he received the American Medical Association’s top government service award in health care, the Dr. Nathan Davis Award for Outstanding Government Service. Dr. Evans is also regarded as a strong advocate for people experiencing behavioral health conditions and was recognized by Faces and Voices of Recovery with the Lisa Mojer-Torres Award. On Saturday, December 12, the White House Office of Science and Technology Policy (OSTP) convened data scientists, engineers, designers and subject matter experts in Boston, Washington, New York, Chicago and San Francisco to hack mental health. These integrated jams in five cities were a follow-up to the Partnerships for Suicide Prevention data summit, hosted by the Obama Administration on October 9, as part of Global Mental Health Day for Suicide Prevention. The mission of these events: leverage data and technology to strengthen mental health and suicide prevention efforts. Behavioral Health Link’s CEO Wendy Schneider and Chief Innovations Officer Mark Livingston participated in the Washington event which was held at Impact Hub DC, and shared their experience with me. Wendy described the palpable energy as the first ever US Chief Data Scientist Dr. DJ Patil welcomed the group. “Data science is a team sport, and we all have to do this together,” he began. His keynote address was an inspiring start. The stir to action was commitment to our responsibilities as citizens and stepping both feet down on the challenge of suicide. “Citizenship is a verb,” challenged Beth Flores, Managing Director for Impact Hub DC. This is transformed government. Dr. Patil encouraged the group that “the best ideas for policy come from outside the building.” Anticipatory. Collaborative. Outcomes focused. Transparent. Mark and Wendy were able to share the technology innovations and decade-long data stream created by the bhlweb system with the Georgia Department of Behavioral Health and Developmental Disabilities. Since 2006, the “air traffic control” technology integration of the Crisis and Access Line has dramatically reduced wait times for intensive services and reduced reliance upon costly and intrusive acute care services. There was a lot of buzz about the cutting-edge Georgia approach to care coordination (see it in action here), but what jazzed Wendy and Mark was the spirit and dialogue of this diverse group and the juxtaposition of suicide prevention experts and policy makers alongside data scientists and entrepreneurs. Just striking. The BHL leaders returned to Atlanta inspired that we mental health leaders should take more risks, be more agile, cross-pollinate much more frequently and spark more movements focused on making change happen… today. Note: President Obama declared World Suicide Prevention Day on September 10, 2015. Remember that one brilliant student in school that always got the maximum score on the test… thereby blowing the curve for everyone else. This past week I traveled to Charlotte to speak at an event sponsored by Carolinas HealthCare, and Carolinas is that student when it comes to behavioral health. I spoke alongside Carolinas’ Dr. John Santopietro at a HEALTHWORKS event attended by over a hundred employer leaders. Dr. Santopietro is a nationally prominent healthcare leader educated at Harvard Medical School and Yale and recently quoted in the Washington Post on healthcare reform and parity. HEALTHWORKS is a division of Carolinas HealthCare, which is one of the largest non-profit organizations in the United States with 40 hospitals, 900 care locations, 60,000 employees and nearly $9 billion in revenues. After the morning event, I had the opportunity to visit and tour The Mindy Ellen Levine Behavioral Health Center in Davidson and learn more about Carolinas HealthCare. During the short 30 minute drive north of Charlotte, Dr. Santopietro related the history and described the “clinical soul” that Carolinas has infused into their culture and programming. My anticipation built as I imagined what this would look like capitalized. In 2012, Carolinas launched a behavioral health service line, and hired Dr. Santopietro as Chief Clinical Officer and Martha Whitecotton as Senior Vice President. Their decision to go all in was driven by several factors. The shift of hospital systems from Curve 1 (fee-for-service) to Curve 2 (value payment/population health) is accelerating (more here), and a mental health diagnosis, like depression, can increase the cost of care by 60 to 70 percent. The impact of people waiting in their Emergency Departments for days because of mental health and addiction challenges. Carolinas’ baseline average delay was 40 hours, and they believed they could improve the experience and performance by investing in behavioral healthcare. Carolinas already possessed key behavioral health infrastructure through a no-cost contract with Mecklenburg County. They had not previously integrated these programs into their larger enterprise or invested materially in their advancement, but they had experience with physical health integration, telepsychiatry and bed placement systems. The speed with which Carolinas has created a world-class system is dizzying. As we left the main road towards their Davidson facility, I assumed we had taken a wrong turn. Nestled in a perfect rural setting surrounded by woods, the facility looks more like a resort. “Does this feel like you are in a psychiatric hospital?” asked Dr. Thomas Gettelman, Vice President & Facility Executive, as we toured the 66 bed, three unit program. He was right; I’ve never seen anything like the thoughtful attention to detail that this program has at every step. While most individuals convert to a voluntary status for the services at Carolinas’ Davidson center, a collaborative approach with the Chief Judge, public defender’s office and the county magistrate resulted in tele-court for those individuals on involuntary commitment (IVC). A family practitioner provides integrated medical coverage during day-time hours. Clinicians are trained in CBT and DBT with a strong focus on recovery. And, Peer Specialists on each of the programs units have replaced some of the traditional technician roles to provide coaching, peer supports and post-discharge navigation (see Carolina’s Peer Support Specialist Joe Swafford’s YouTube presentation on hope and recovery). The design has been nursing and physician driven with a strong focus on the Patient and Family Advisory Council, and the results show! Dr. Gettelman spoke with pride about how hospitals become part of the soul and essence of a community, and in this case it is a behavioral health hospital in Davidson. It seems that top leadership at Carolinas HealthCare feel that way, too. Their 2015 Impact Report prominently highlights their innovative approach to behavioral health. In fact, it’s first before key sections on ICUs and cancer care. Carolinas is truly blowing the curve, and they are doing it with a combination of strong investment, medical and clinical expertise and heart that will be changing the way behavioral health is delivered for decades to come.